Adams vs. Jefferson: the tumultuous election of 1800. · One Book. One Author. One Hour. Adams vs. Jefferson: the tumultuous election of 1800. 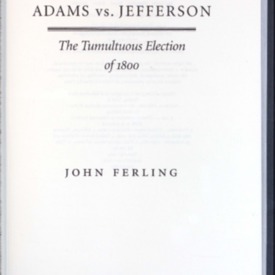 Ferling, John E, “Adams vs. Jefferson: the tumultuous election of 1800.,” One Book. One Author. One Hour., accessed April 19, 2019, http://booknotes.gmu.edu/items/show/671. A history of the presidential campaign of 1800 follows the contest between the two candidates, Adams and Jefferson.